Everything you need to hang your show. A stage is only as good as the equipment behind it. And today’s artists demand better quality equipment and stage options than ever before. Quality rigging and staging equipment give performers the freedom to make their visions turn into reality. With quality, safe stage rigging and equipment, artists can use pyrotechnics or can “fly” into the air above the crowd. They can handle multiple scenery and lighting changes and treat the audience to high-octane and impressive shows. The reality is that stage rigging equipment is often the hidden star of the show. Especially with quality equipment, it is usually unobtrusive and barely noticed by the audience – yet it allows for the most impressive stage and performance techniques to take place. Quality equipment for stage rigging systems makes a whole new world of performance possible, while keeping both performers and audiences safer. 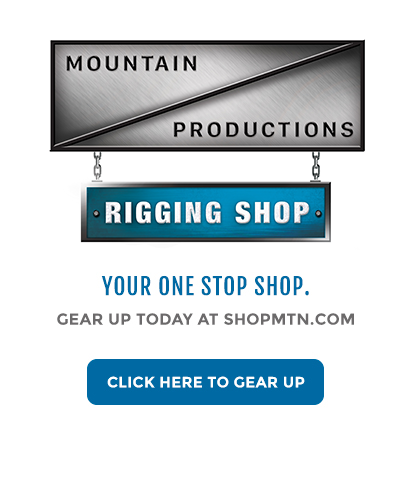 Mountain Productions has the available products and knowledge for all of your hoist and rigging needs. For more information on the products we have available, keep reading. But if you are ready to purchase high quality rigging and fall protection products, visit our brand new online store. Electric chain hoists — CM's chain hoists are second to none. The Lodestar is one of the most reliable motors in the industry, and it's perfect for lifting and securing overhead trusses, lighting and sound. Manual chain hoists — Perfect for smaller venues and one-time events, Mountain Productions carries a wide range of CM's crank manual hoists. These cost-effective rigging solutions are compact and lightweight. Winches — Mountain Productions carries electric and hand-operated winches from CM. These winches are reliable, fast and flexible, and suitable for scenery and décor. Rigging — CM's rigging equipment is the strongest and most reliable in the industry. We carry shackles, STAC chain, wire ropes, trolleys, beam clamps, roundslings, turnbuckles and more. Electrics — Making sure your event systems run smoothly is a job for our hoist controls, power distribution systems and load monitoring equipment. Mountain Productions also carries cables and other essential electrics accessories. Truss — Mountain Productions carries the best domestic trusses in the industry, and we can help you choose the truss that's right for your event. Chain bags — Our chain bags and hoist weather covers are manufactured on site and ready for delivery. Designed for CM hoist products, our chain bags are suitable for indoor and outdoor use, and can be customized for any name brand hoist. Cases — No one knows your equipment better than Mountain Productions, and our MTN BOX® road case will help you stow, store and transport your gear safely. ATA flight cases are also available. Fall protection — Stage worker safety is our top priority and we are proud to distribute DBI-SALA fall protection and rescue products. Safety Gear — Helmets, gloves and drop prevention are all essential for protecting everyone on the job site. Tools — Having the right tools for the job is essential in any industry and rigging is no exception. Theatre Rigging Equipment — Theater rigging equipment keeps things moving safely and smoothly at any performance, and Mountain Productions can offer quality rigging equipment designed for the job. Service And Genuine CM Replacement Parts — Mountain Productions provides complete repair and maintenance services. At Mountain Productions, our mission is to provide customers with the highest quality staging and rigging services in the industry. No job is too big or too small, but every job has to be done right. We've staged, engineered and constructed music festivals, fairs, religious celebrations, corporate events, college graduation ceremonies, concerts and more. A leader of stage rigging companies, founded in Wilkes-Barre, our services cover events throughout the USA and other countries. Whatever your needs, we are confident we can design and construct an event venue you'll never forget. In addition to rigging products and services, Mountain Productions also provides platforms, roof grids, seating, security barricades, custom softgoods, towers, groundcover and more. Mountain Productions has everything you need for a professional event of all sizes. Mountain Productions has 30 years of industry experience. We carefully select the best rigging, staging, and other products and equipment you need for your event. Whether it’s fall protection, chain hoist bags, or equipment for stage rigging systems, we carefully research and select the best products available. Each time, we look for quality, reliability, safety, and comfort. We only offer products we use ourselves and products we stand behind. Our goal in every case is to help you put on the best event possible while meeting the highest standards of safety. For more information about the staging and rigging products and services available from Mountain Productions, contact us for more information.